Co-hosted by the Tax and Transfer Policy Institute and the Development Policy Centre. As Governments expanded their activities over the years, pushing spending from around 10 per cent of GDP at the beginning of the last century to the current levels of 30 to 50 per cent of GDP, while increasing intervention through regulations, they tended to lose much of their ability to monitor well what they did. This led to problems of corruption, inefficiency, rent seeking, cronyism, and generally less equitable results in terms of economic results and income distribution. 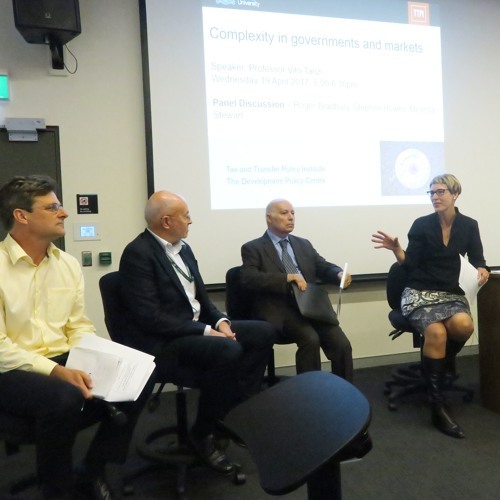 Professor Vito Tanzi will present and discuss the challenge of complexity in governments and markets in terms of tax, spending and regulation. Vito Tanzi obtained his PhD in Economics from Harvard University and was subsequently a Professor at American University before becoming head of Tax Policy in the International Monetary Fund(IMF) from 1974 to 1981, and Director of the IMF’s Fiscal Affairs Department from 1981 to 2000. He was State Secretary for Economy and Finance in the Italian Government and Senior Consultant to the Inter-American Development Bank. He is recipient of numerous awards and honours and has published widely on public finance, tax, expenditure and regulation for developed and developing countries. Publications include Public Spending in the 20th Century (Cambridge U Press, 2000) with Ludger Schknecht; Taxation and Latin American Integration (Harvard University, 2008); Peoples, Places and Policies: China, Japan and Southeast Asia (NY: Jorge Pinto Books, 2008) and Government versus Markets (Cambridge University Press: 2011). Government versus Markets was also published in China and in 2014 was chosen as one of the 8 most important financial books of the year. He has also written numerous articles on tax and globalisation, fiscal termites, corruption and the shadow economy. Following the keynote speaker, an In Conversation panel discussion will be held with Vito Tanzi, Miranda Stewart – Tax and Transfer Policy Institute, Roger Bradbury – National Security College and Stephen Howes – Development Policy Centre.